I’m sure it’s some kind of exercise, but I don’t care what CrossFit is. Below, are the words constantly varied, high intensity, and functional movement. That text clarifies what CrossFit is somewhat, but it still doesn’t make me want to exercise. Before I go any farther, I should say that I am on an exercise program. I do weights every other day, and mix in 40 minutes of cardio on off days. I know about exercising. I know the benefits of exercising. True, the government still classifies me as obese, but I think that has more to do with what I eat, than a lack of exercise. Anyway, back to the postcard. You can see the back of the postcard simply gives a couple more statements that explain what CrossFit is, and that I can try it 10 days for free. Finally an offer! Now it’s obvious who the target market for those headlines is. There could be headlines and messages specific to men as well. 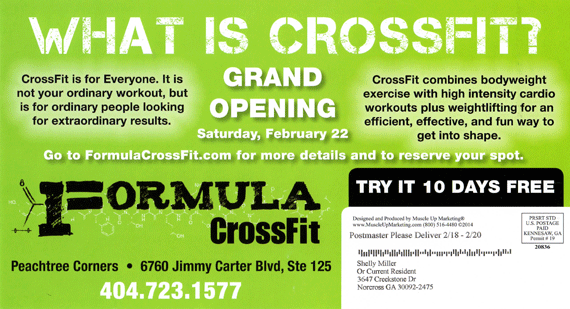 I think the thing that formula CrossFit has going for it is: even though this is a general message and the postcard isn’t that great, the people who are exercise fanatics and want to step up their game would go to the website to learn more. 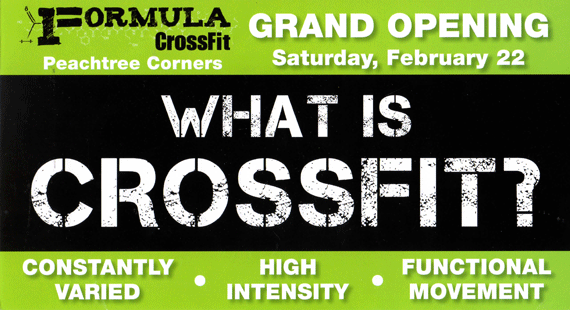 The question is, is that group big enough to support formula CrossFit? If not, they will have to develop messages that are more specific to an audience large enough to sustain them. 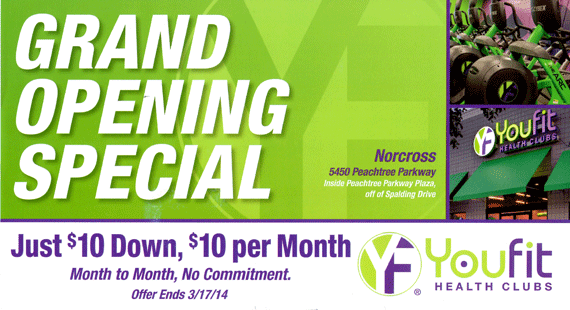 YouFit’s postcard starts out with the headline “grand opening special.” Did I mention that I don’t care? The great part about this card is that it has a powerful offer front and center. Just $10 down, $10 per month — month-to-month, no commitment. Offers are very important, because without them the advertisement cannot be direct response. The problem with this card is the pictures on the back of the postcard. They point out a potential business model issue. Here’s what I mean. When you look at these pictures, you see one TV in the entire place. Golds gym has been in the area for five years. In that time they added TVs everywhere. They even expanded, and added a movie theater and filled it with cardio machines. What this tells me is the customers in this area like to be entertained while they exercise. When you look at YouFit’s postcard, you don’t see TVs anywhere. If you go there to work out, it looks boring. I won’t make a comment about the green and purple colors right now. Let’s just focus on boring. But I also wonder if there is a locker room. Am I going to be changing my clothes in a bathroom? Now obviously I could go there and see, but it’s just not important enough to me to do it. I already exercise. I can do it at home. I don’t care that it’s only $10. If it’s not fun, or entertaining… and if it might be uncomfortable: I’m not going to do it. 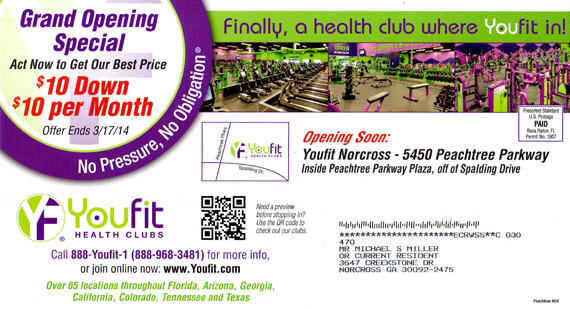 It’s important to contrast YouFit’s postcard with Golds Gym’s postcard. So let’s look at Golds Gym next. Before we look at golds gym’s postcard. Let’s point out that Golds Gym has an advantage here. Golds Gym offers cardio theater, TVs everywhere, Zumba classes, yoga classes, all types of cardio classes, and a full large, nice locker room area with plenty of space to change your clothes, with a full shower complex. You could easily take your clothes to the gym each morning workout, and then dress for work and go straight to work from Golds Gym. You get all that for just $25 a month. So when you compare $10 a month for a questionable gym that may not have all of the benefits that Golds Gym offers, with $25 a month and all of the stated benefits and more, does a $15 savings a month really matter to you? That’s the price of one or two lunches per month. If you were going to go to a gym, wouldn’t you choose the gym that was more like a club? That had all of the features and benefits you would use? Price doesn’t matter to me. The benefits I receive are what matters. 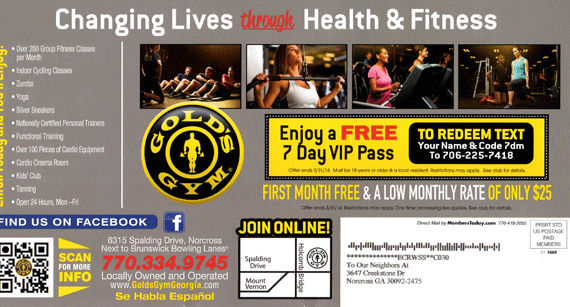 So now as we look at this Golds Gym postcard, we have to wonder why the headline says “changing lives through health and fitness.” That is one of the weakest headlines I’ve ever heard. To their credit, they do have an offer on the front, which is first month free and a low monthly rate of only $25, and they list the features they offer on the back. But overall, this postcard does a poor job of clearly explaining why most people would prefer to go to golds gym. It doesn’t take much thought to identify the benefits that Golds Gym offers its clientele, and how those offerings are superior to the other businesses. But Golds Gym failed at mentioning any of them. Instead, they bet on the offer of first month free and a low monthly rate of only $25. That’s a price play. If the only persuasive point Gold’s Gym can make is price, why wouldn’t everyone go to YouFit for $10 a month. Before I wrap this up, I would like to point out that formula CrossFit could charge $100 a month for their services if they guaranteed that in six months I would look like a Greek God, be the envy of men, the dream of women, be more confident, be stronger, be more charismatic, intimidate competitors, and make every sale. As a copywriter, I believe I could make those connections and get more people to become clients as a result. At the end of the day, these gyms need to realize that in order to keep clients, and get more new clients, their job is personal development and motivation. If they went at the target market that absolutely loves to exercise, they would go broke. What they need to do is to learn how to incorporate motivation to change, to achieve, to become, to transform into their offerings. The easiest way to do this is to use an idea Shelly came up with several years ago. She envisioned a gym where each client had to pay $280 a month as a membership fee. Each time they came and exercised, they got $20 back. If you came to the gym and worked out three days one week, and four days the next week, as all the top professionals suggest, then you could end up working out for free. The reason this business model would work, is because most people with gym memberships visit the gym three or four times a month. So, there is a lot of profit in this model, but there is also a lot of motivation to get people to exercise.